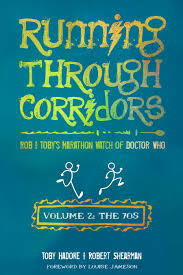 I didn’t catch the first instalment of the ‘Running Through Corridors’ story, so wasn’t sure exactly what to expect. I know of Robert Shearman & Toby Hadoke and have had the pleasure of interviewing them for my podcast; both had mentioned the book and I had always meant to get round to it. So when the second instalment came out and Mad Norwegian Press asked me to review it I jumped at the chance.